Welcome to our ACIM community! We can choose Love as our Guide even in the world of form. Click here to read the full post. 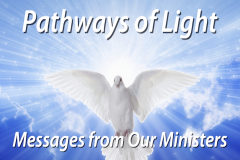 The Pathways of Light community supports applying A Course in Miracles in our daily lives. Click here to e-mail your questions. Click here to request our free catalog and sample Miracles News magazine. We are dedicated to joining with people around the world in awakening to the Love and peace of God within us all. Would you like to participate in a group of like-minded people interested in A Course in Miracles? Click here to learn how you can take your practice of the principles of A Course in Miracles to a deeper level of healing and forgiveness.